The Scott a very fun river, full of big, soft holes and long, pushy boulder gardens. 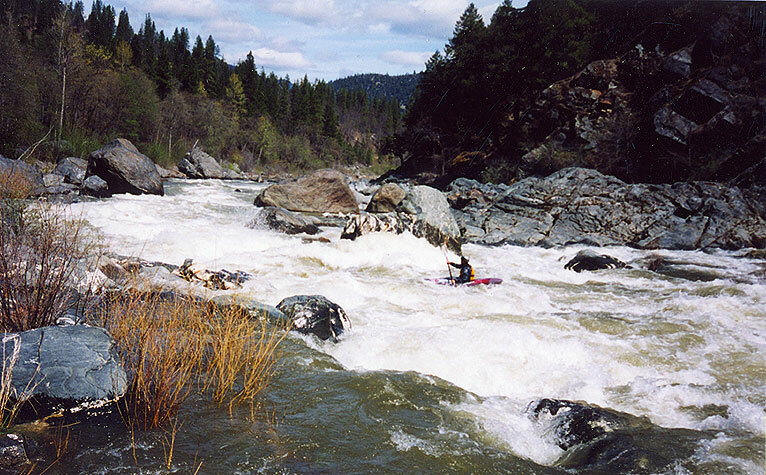 We ran the Scott on the last day of our epic Spring 2002 California Creekin' trip. 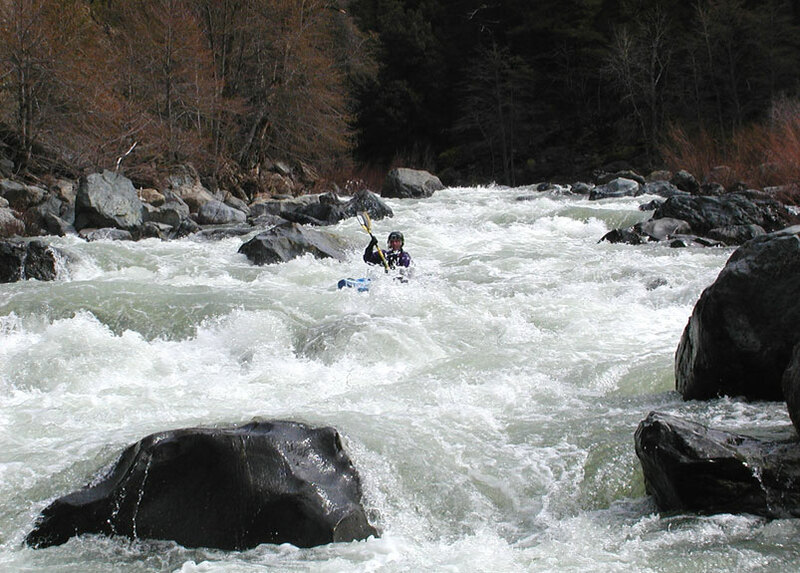 The goal was to paddle something with some class four and five whitewater on the way home, but nothing that required too much of a commitment. We briefly considered Burnt Ranch Gorge, but it was insanely high at the time and only Jesse was really serious about running it..
That put us an hour south of the Oregon border with plenty of snowmelt powering the rivers, and the Scott seemed like just the thing. The Scott is a tributary of the Klamath, and like it's sister river has a big-water, punchy feel to it. As we drove up the road that is cut into the impressive canyon wall we got some glimpses of a few rather large rapids (when they look big from two hundred feet up, you know it's gonna be good...) and we were stoked by the time we got to the put in. While we were getting ready two separate groups of paddlers stopped by and warned us about Bridge Creek Falls. "You guys know what's downstream?" They asked, and every time they did Jesse's grin got bigger and bigger. "That's a real tough drop, like V+ " one guy said. "It's harder than it looks.."
Jesse was stoked about warming up on the 'Falls', which is actually a large, complex boulder garden formed by a recent landslide. We scouted this drop from the left bank, noting the numerous pin spots, undercuts, and generally unstable nature of the rapid. I often walk difficult rapids that are formed by recent landslides because they are much more likely to contain siphons and other hidden hazards, and today was no exception. John and I opted to put in below the falls, while Jesse headed up stream to "warm up" on the hardest rapid on the river. "Let's end this trip with a bang!" he said, grinning as he tossed his boat on his shoulder. While we waited, John and I scouted out the middle of the rapid for the best places to set safety. As always I chose the best spot for safety first, then for photographic value second. Fortunately I was able to find a spot that fit both needs well, and we watched as Jesse proceeded to have a clean and rather exciting line right down the gut of the rapid..
Jesse in the middle of Bridge Creek Falls on the Upper Scott. Only about half of the rapid is visible in this photo. Immediately below Bridge Creek Falls is the first class IV rapid, which gave us the first taste of getting pushed around after paddling lower volume creeks for the last week. Soon enough we were warmed up and thoroughly enjoying this river! 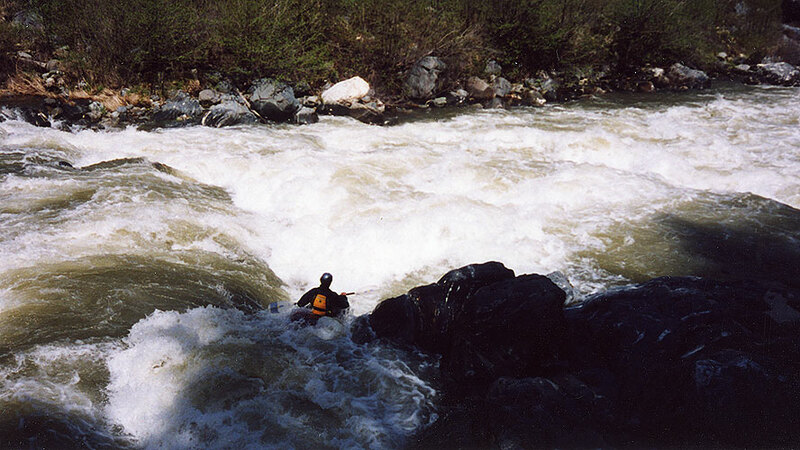 Pete Giordano runs Canyon Creek rapid, which is just downstream from Bridge Creek Falls ( taken on a later trip ). Downstream Canyon Creek entered on the left, pumping up the river even more. Soon enough we came to another horizon line. It should be noted at this point that the Scott is often rafted, and the raft guides had tied pieces of ribbon above each rapid. I find this practice to be highly annoying, but after awhile we starting joking about it. "Ohhhh man, this is a ** FIVE ** ribbon drop.. it must be REEEALLY SCAAARRY... "
Soon we got out to scout a horizon line where most of the hole plunged violently into a large hole in the middle of the river. (I think the locals call this drop "Tombstone".) Anyway, Jesse saw that hole in the middle of the river and made a beeline for it, running right down into the meat as usual. He disappeared into it and surfaced a couple of seconds later on the pile downstream, but he appeared to be having trouble rolling. "Uh oh.." I said to John. "He broke his paddle in there!" Jesse rolled up and C-1'ed the rest of the drop, and by that time we were laughing and generally being good-naturedly obnoxious about his bad luck. I broke out my spare paddle for Jesse, and we headed down the river. Jesse, snapping his paddle in the hole at Tombstone. The next major drop is known as White House, because there used to be a White House adjacent to the drop. However, the hole in the main drop is the biggest on the river, and it so this drop still lives up to it's name in spite of the lack of white houses nearby! I was out in front when we arrived at this drop and I caught a small, surging eddy against the right wall at the last minute and got out to scout. After a good look I gave Jesse the thumbs up and the "stay right" signal, and watched while he cleaned it, avoiding the hole on the right. I had a hard time getting into my boat due to the surging eddy, and when I peeled out immediately above the drop I had no speed, which wasn't good! Almost immediately the reaction wave-holes off of the right wall started surf me towards the middle of the river, right into the gut of the main hole. As I dropped in, I thought for sure I was going for a ride I wouldn't soon forget! 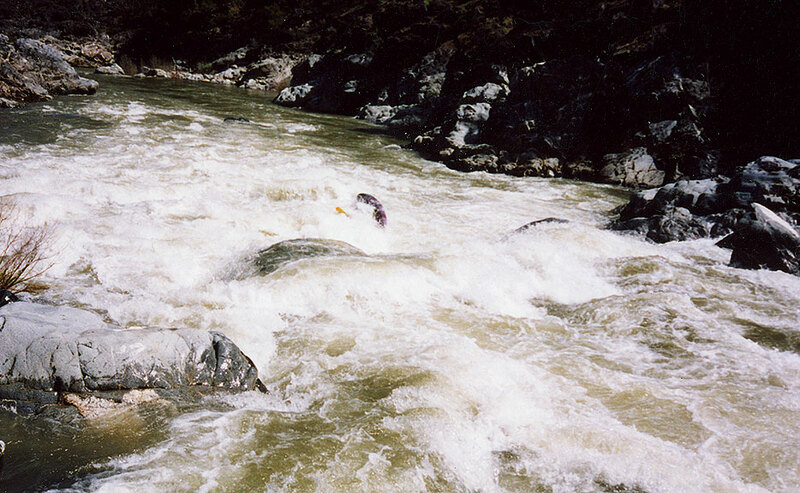 I squared up, dropped in, and took a few hard strokes and somehow got surfed out almost immediately, but that was enough for John, who portaged this drop on the right side after watching my near-trashing..
Downstream was another large, fun drop we boat-scouted, and then we encounted the second class five rapids on the river, a classic drop known locally as Schuler Gulch rapid. This drop was sweet, and much too large to really get into one photo..
Jesse, at the top of Schuler's Gulch rapids. 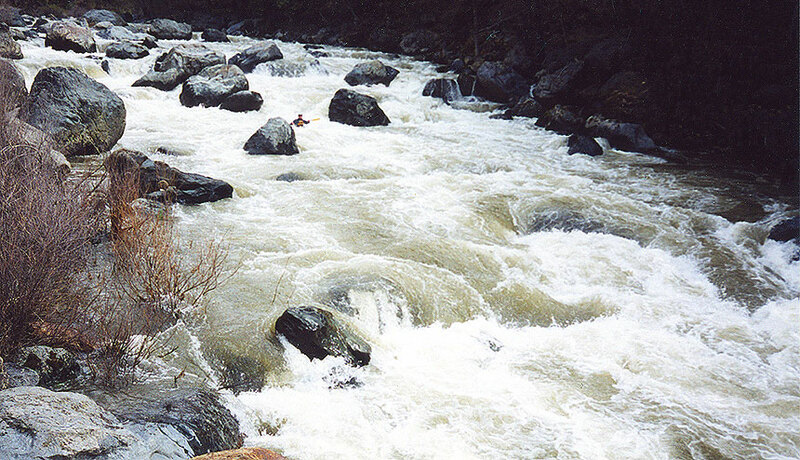 Only about half of the rapid is visible in this photo, and the main hazard is the large, undercut boulder visible downstream on river left. Below Schulers the river mellowed but still had plenty of great canyon scenery. This run was a great way to end our trip, and I am definitely looking forward to my next run down this river, which is truly a classic, especially in the spring. We had about 1,200 cfs on the internet gauge, which was a nice medium flow.